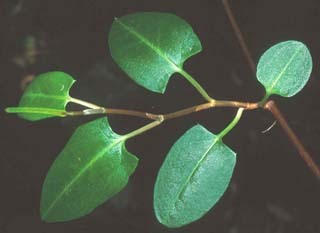 Muehlenbeckia gunnii (Macquarie Vine) is a common, robust twining native plant with large leaves. It is widespread in and near wet forests, especially in the west of the state. Unlike M. australis, the leaves have hastate bases (i.e. 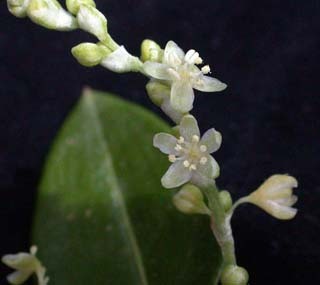 they are truncated, but with small wings at either side), and the flowers are about 8mm wide.